Today is starting off better. Yesterday, Tehilla was hysterically crying when not on Morphine or Oxycode. She clearly was in pain and uncomfortable from something and wouldn't eat by bottle. 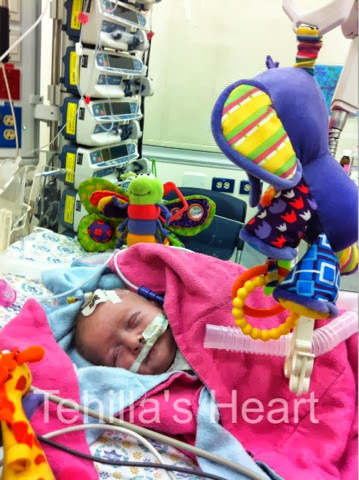 The doctors and nurses had thoroughly looked for any possible causes, other than being 12 days after open heart surgery and her mostly unswollen arm and chest and hadn't found anything. They assumed it was probably still from her arm. Today, she is calmer, eating better and does not appear to be in pain. She has been switched to formula for the time being, due to a fat in breast milk interfering with lymph nodes in her chest.